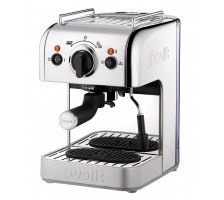 Out of all of our coffee machines, The Dualit Coffee System is theconnoisseur's choice. If you find perfecting the art of coffee making just as much part of the pleasure as drinking it, this coffee machine will suit you to perfection. Each step in the coffee making process can be personalised to suit your taste, but despite this it's also practical to its core. Choice is maximised and error minimised. Experiment with a world of freshly ground beans from our Dualit Burr Grinder, and we can guarantee you'll taste a coffee that's as good as it can be. Since it's an ESE pod coffee machine as well as working perfectly with any freshly ground coffee you choose, it'll even suit you on days you're after just a quick cup. And by quick, we mean super quick. Not bad for a coffee machine that oozes authenticity at every step. We can safely say that the Dualit Coffee System makes as good a coffee, as perfect a crema, and as delicious a froth as any coffee maker on the market. If you're a coffee drinker that wants the real thing and wants it as efficiently as possible, the Dualit Coffee System is the coffee machine for you. Coffee pods are a clean and quick alternative to ground coffee, for use in all ESE compatible coffee machines. 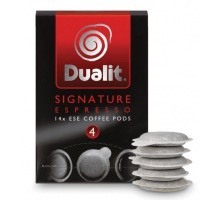 Dualit’s size 44 ESE coffee pods are individually sealed in foil for freshness and are ideal for single 7g servings. Designed for use with the Dualit Coffee System and all ESE compatible machines, they are sold in either 15 pod or 50 pod quantities, in a choice of 5 flavours including 1 decaf. For days when you want a quick cup that still tastes exceptional, our coffee pods are perfect. are the ultimate in speed and convenience, delivering a shot of coffee – from a strong, dark espresso to a milder blend that makes the perfect latte – with the minimum of fuss and mess. The capsules are designed for use with the Rapido and other Caffitaly system coffee machines. Five variants comprise three blends of coffee (7.5g or 8g portions) plus milk and chocolate. 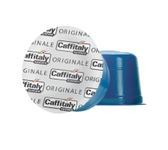 Caffitaly Capsules are sold in 80’s. 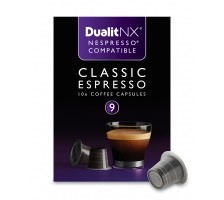 With the convenience and flavour you can expect from all of our Dualit single-shot, ground coffee products, the NX Cafe Caps are the ones for you if you have a Nespresso Compatible coffee machine. They come in two flavours that we've specially selected to work well alongside the British taste for longer drinks, whilst also delivering the perfect crema.